Gemma Lacey from The Southern Co-operative. Volunteer projects returning traditional skills to the New Forest have been recognised by a countryside awards scheme. 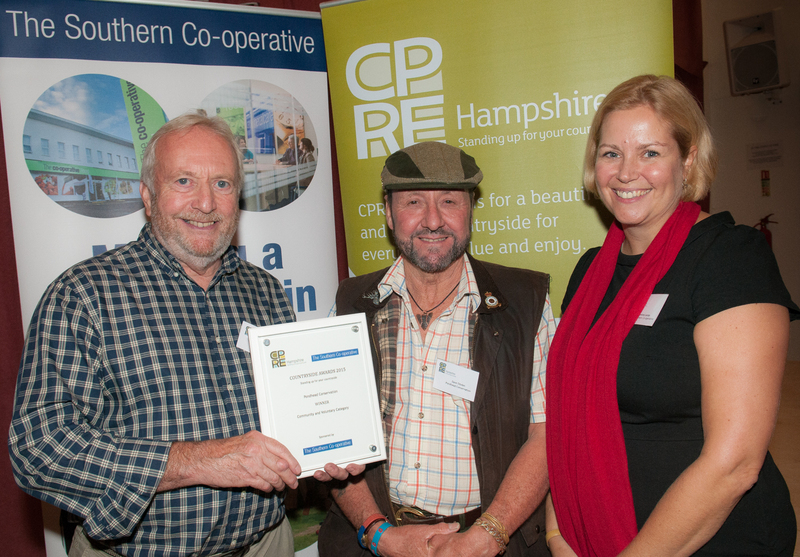 Pondhead Conservation Trust and Buckler’s Hard Shipwright School were victorious in the annual Campaign to Protect Rural England (CPRE) Hampshire awards. Both projects are funded by the New Forest National Park Authority’s Sustainable Communities Fund (SCF), which aims to strengthen the well-being and sustainability of communities within the National Park. The CPRE Hampshire Countryside Awards was established in 2007 to recognise projects that enhance the environment and quality of life in the county. Winner of the Green Buildings category was the Shipwrights School at Buckler’s Hard, which received a £20,000 SCF grant and is now home to students on rotation from the International Boatbuilding Training College in Portsmouth. It is hoped that the school will also help visitors to the attraction near Beaulieu will gain a better understanding of the industry which gave the village a place in British naval history. Pondhead Conservation Trust won the Community and Voluntary category for its volunteers’ work to manage Pondhead Inclosure near Lyndhurst using traditional woodland skills. The charity received £23,000 from the SCF and aims to encourage a greater diversity of wildlife and plant life in the inclosure, as well as making the area more accessible for local people. Marian Spain, National Park Authority Member, said: ‘I’d like to congratulate both these projects on their awards; they’re excellent examples of the benefits of the Sustainable Communities Fund. Derek Tippetts, from Pondhead Conservation Trust, said: ‘Our project was set up to support and continue our coppice manager, Dave Dibden’s restoration work in this 76 hectare area of woodland in the heart of the New Forest in order to improve its biodiversity and public enjoyment. The SCF is a grants scheme run by the New Forest National Park Authority that helps promote sustainable living and working within the National Park, with grants available for up to 75 per cent of a project’s cost. Provide sustainable transport options, to help enable visitors and residents to travel car-free in the New Forest and reduce the impact of traffic. Conserve the biodiversity of the National Park by supporting local landowners to deliver wildlife conservation improvements and resilience against climate change. To find out more visit www.newforestnpa.gov.uk/grants.